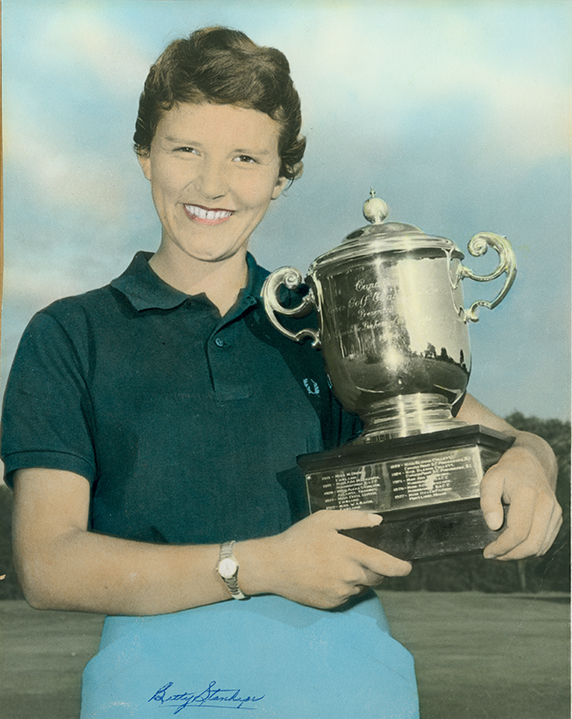 Betty Standhope-Cole with championship trophy, 1957. Photographed by Ted Harrison. Image courtesy of the City of Edmonton Archive EA-20-270. Just east of the Capilano Bridge, there is a small park overlooking the Highlands Golf Club. It has a view of the River Valley and nearly all of southeast Edmonton. It is named for a long-time, and very highly accomplished, member of the club at Highlands, Betty Stanhope-Cole. You wouldn’t know that by walking through the park though. “How could I have missed that sign?” I wondered, looking at pictures of the park online, believing I’d overlooked a monument. I’d visited Betty Stanhope-Cole Park earlier in the day, but when I looked at pictures of it online, I noticed a plaque listing Stanhope-Cole’s accomplishments, a crucial component for anyone unwise to Edmonton’s golf history who happens to be passing through. Betty Stanhope-Cole in front of the park sign, named in her honour and beside a boulder with a plaque listing her accomplishments. Photo courtesy of Ted Smith, 2011. The opening of the Betty Stanhope-Cole park and Betty with her three grandchildren who helped unveil the new sign. The Highlands Golf Club is visible in the background. Photo courtesy of Ted Smith, 2011. Later on, in a conversation with Ted Smith, Highlands’ club historian, I was informed that the sign was stolen in early 2015. The plaque would make a curious, not to mention heavy, prize for a vandal, or perhaps just an over-exuberant golf fan. It’s a list of accomplishments, awards and championships so long that it must have taken at least a couple people to make off with it. Betty Stanhope-Cole has retired from competitive golf, but throughout the fifties, sixties and seventies she dominated Alberta’s golf scene and made her mark in golf both nationally and internationally. I had the pleasure of speaking with Stanhope-Cole and the conversation proved enlightening, not only to Edmonton’s history, but to golf’s as well. Betty Stanhope was born in 1937 in Calgary, but moved to Edmonton as a teenager. Her parents were both golfers, but she first took up tennis. Her interests and fate would change though, when her father, Bob Stanhope, was supposed to have a golf lesson at the Grierson Hill Driving Range with none other than Edmonton’s own golf guru, Alex Olynyk. Bob Stanhope was unable to make the lesson and Betty’s mother suggested that she go in her father’s place. “I got hooked,” Stanhope-Cole said. She ended up working at the driving range for the summer, which gave her the opportunity to hit golf ball after golf ball, the basics for the rest of her career. Alex Olynyk wouldn’t be the only mentor Stanhope-Cole would have on her path to stardom. She still remembers her first lesson with another Edmonton golf-legend, Henry Martell, the Head Professional at Highlands, as of 1948 and later winner of two Canadian Professional Golf Association Championships. She went on to caddy for Martell, an experience that was invaluable for her. Martell would hit the ball a certain way and then tell Stanhope-Cole why and how he hit those shots in the way that he did. Imagine following Mike Weir around and listening to his explanation for every shot he made. Your golf game would improve in a hurry. Betty Stanhope-Cole’s game did just that. By 1951 she had captured the Alberta Junior Girls’ title and two years later she was the Canadian Ladies Amateur Champion. From there on out it is only championship after championship of some sort or another. Her list of titles includes the Alberta Ladies Amateur Champion sixteen times, the Alberta Senior Champion four times and the winner of the Eastern Provinces Title in 1964. She was the Canadian Ladies Close Amateur Champion in 1967 and represented Canada internationally on five separate occasions. On top of that, from 1952 to 1999 Betty Stanhope-Cole won forty City of Edmonton Championships, ladies junior, amateur or senior. Looking at that résumé today, it seems obvious that she would be named Edmonton’s Outstanding Athlete at some point in her career. It was an honour that she received in 1957, but her competition for the award that year proves just how impressive Stanhope-Cole was. Stanhope-Cole had become the first woman from Western Canada to win the Canadian Ladies Amateur Championship earlier that year, which was clearly a significant factor in deciding on the winner. Looking back, it was not only an appropriate decision, but also an important one. It demonstrated that women’s sports mattered in Edmonton, and the city wasn’t going to overlook the accomplishments of an athlete, regardless of how visible their sport was in Edmonton at that time. I asked Stanhope-Cole if she ever faced any adversity because of her gender and she told me she’d never been treated badly. There was some frustration in her voice, however, when she mentioned buying golf clubs and being talked down to as if she didn’t know anything about the game she was dominating. She went on to praise the members of the Highlands Club for their attitude and treatment of her. It wasn’t only in Edmonton, or even Canada, that Stanhope-Cole found herself paving inroads for women at the time. She represented Canada on the team at the Commonwealth golf tournament on three separate occasions, the first of which being in 1963 in Australia. “We were there in July,” Stanhope-Cole began. I figured Australia in July would probably be pretty nice. “And it was cold!” she laughed. “We were the first women ever allowed at the Royal Melbourne in slacks!” Alberta women truly have the pioneering spirit. The sign that is no longer in the park explained that Stanhope-Cole gave up competitive golf in 1980. That may be the official story, but her contributions don’t stop then. She wouldn’t have allowed it. She won provincial and city, senior championships through the 80s and 90s as well as skipping curling teams and doing work for the Canadian Ladies Golf Association and the Alberta Golf Association. Her contributions to golf in Edmonton are like no one else’s. She set the precedent and a very high bar indeed for any woman wishing to follow in her footsteps. Maybe someday they’ll put up a plaque. Brendan Thompson has worked in various heritage and historical sites in Edmonton. He has a BA in Drama from the University of Alberta.